One reason for Instagram's rapid adoption among advertisers is the pipeline of 6 million active advertisers on Facebook. As Facebook's News Feed faces maximum ad capacity, they're pushing marketers to experiment with Instagram Ads since there's more available inventory. And marketers looking for more audience reach are turning to Instagram as they same targeting capabilities as Facebook. But a question marketers are quick to ask is, how much does it cost to advertise on Instagram? Well, we have an answer. In a brand new report from AdStage, we take an in-depth look at the PPC benchmarks and trends that matter to you and your digital advertising strategy. In Q3, we analyzed over 200 million Instagram ad impressions. 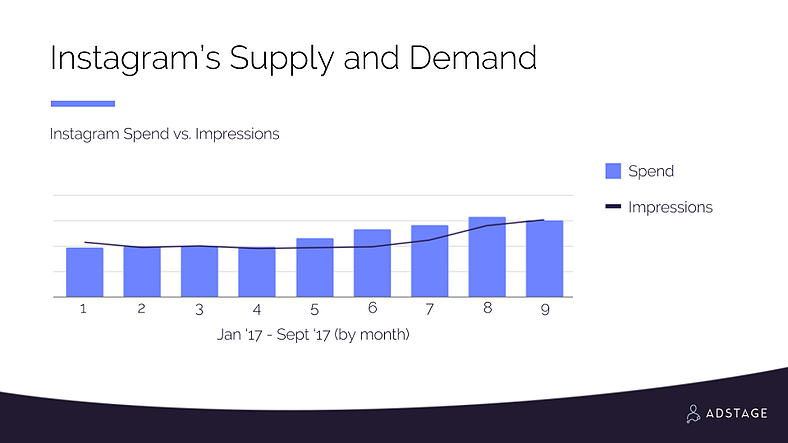 Facebook’s ad impressions are flat while ad spend is moving up. This tells us advertisers are paying more to enter the auction while getting the same number of impressions. Based on our data, we saw CPCs increase by 35% over the first nine months of 2017. The biggest correlation in our CPC data was when Instagram announced new objectives for Stories Ads on May 25th. When first rolling out ads in Instagram Stories, we began by focusing on the Reach objective to help businesses better target and reach the people they wanted to connect with. But over the past three months these capabilities have greatly expanded, giving businesses the ability to purchase ads in Instagram Stories across additional objectives—Video Views, Traffic (formerly known as Website Clicks), Conversions and Mobile App Install. As a result, stories has become a full-funnel solution for a growing spectrum of business objectives. With the rapid growth in users, advertisers, and the strong adoption of new ad features like Stories ads, Instagram is poised to make a splash in 2018. The exclusive Q4 2017 PPC Benchmark Report gives unprecedented paid marketing benchmarks, insights, and trends into what’s happening on the major ad platforms. Just click on the button below to access the full 70+ page report.